Four info sessions on the Music & Arts Library’s Digital Music Lab are being offered in March 2011. The sessions will give an overview of the available software and hardware, designed to enable users to work with digital audio, MIDI, and music notation, and will offer time for questions. Follow-up consultations are also available. These sessions are open to any Columbia students, faculty, or staff. Space is limited, so please note that RSVP is required. Please RSVP at this link. You will receive an email confirming your session. For any other questions, please contact us at musiclibrary@columbia.edu. We hope to see you in the library! This entry was posted in Tips & Tutorials, Trainings and tagged Tips & Tutorials, Trainings on February 23, 2011 by Nick Patterson. Inter-Library Loan or Borrow Direct – which to use? 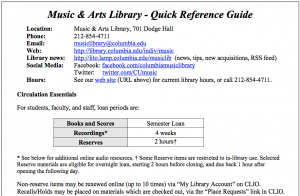 The Inter-Library Loan Office has published a handy guide, which explains the differences between inter-library loan service and Borrow Direct, for those pesky times that Columbia’s Libraries don’t own an item, or all copies are checked out. Highly recommended! Note that music scores can be requested through either service (Borrow Direct is faster). While ILL is the recommended service for recordings, be aware that many libraries do not supply media. One other possibility: Princeton, who participates in Borrow Direct, will generally supply sound recordings. Because the Borrow Direct search interface allows searching only by title or by author, it can sometimes be challenging to search for music scores or recordings. If you need some help in doing this, please contact us at music@libraries.cul.columbia.edu – we’ll be happy to help you try to track things down. This entry was posted in Tips & Tutorials and tagged Tips & Tutorials on October 6, 2009 by Nick Patterson. Streaming audio content available on Naxos Music Library and Naxos Jazz is now indexed in CLIO! Over 4,500 records from Naxos Music Library and 1,500 records from Naxos Jazz have been added. This means that when you are searching CLIO, any available Naxos streaming audio content which matches your search will come up, along with the usual results for CDs and LPs held by the Libraries. The CLIO records include contents, performers, track information, etc. To access the audio, click on the link in the CLIO record which says “Online Link: Naxos Music Library streaming audio”. This will take you to the Naxos record, where you can select the particular track(s) you wish to hear. If you don’t want to have to remember these keywords, you can also just do a keyword search using “naxos” and then add “jazz” or whatever other search terms you like (artists, performers, labels, etc). Note that this will also pull up any physical Naxos CDs the library holds that match your search. 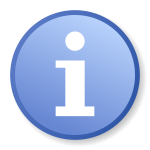 Streaming audio content is easily distinguishable from CDs by the “ERESOURCES” call number. Lastly, please note the variety of audio player options available on the Naxos site. If you are experiencing playback problems with one player, try one of the other options. If problems persist, please let us know at music@libraries.cul.columbia.edu. Please have a listen, and let us know if you have any questions, comments, or problems. This entry was posted in Audio, Databases, E-Resources, Jazz, Recordings, Tips & Tutorials and tagged Audio, Databases, E-Resources, Jazz, news, Recordings, Tips & Tutorials on August 12, 2009 by Nick Patterson. One interesting area of content that may not be immediately noticed is an archive of audio interiews, available by clicking on the “Audio” link on the left-hand navigation menu. Spanning from 1970 through 2006, these audio interviews feature artists such as Bo Diddley, David Bowie, Tom Waits, Ronnie Spector, Van Dyke Parks, Randy Newman, Leonard Cohen, and many others. Also included, at the end of the listings under “others”, are interviews with record producers, sound engineers, and producers, including such noted figures as Ahmet Ertegun, and Gamble and Huff. The interviews are encoded as downloadable 128kpbs MP3 files, which is adequate for spoken word content. The context and location of the interviews is not always clear, and it would be nice to have more information provided. There are links provided to additional articles by the interviewers. This entry was posted in Audio, Databases, Popular Music, Tips & Tutorials and tagged Audio, Databases, Popular Music, Tips & Tutorials on May 1, 2009 by Nick Patterson.